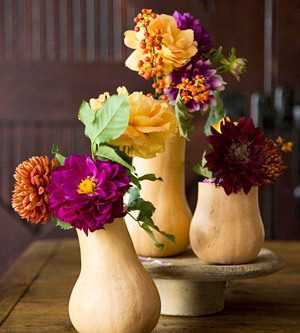 For a seasonal vase, cut off the top of a butternut squash (about 1/4 of the squash height) and scoop out the flesh. Add water and arrange dahlias, sunflowers, zinnias, or other autumnal flowers in the vase. For a Thanksgiving table, line several squash vases along the center of the table, setting some on footed plates for height variations.